Already more than 100 years ago Drude developed a theory for the electrical and thermal conduction of metals based on the classic kinetic theory of gases. Drude considered a metal to be a lattice-reservoir filled by a gas of electrons, which move freely between the scattering events on the ions of the lattice. Considerable improvements in the quantitative estimates were made later by Sommerfeld, which account for the quantum mechanical Pauli exclusion principle of the electrons, what leads to the Fermi—Dirac energy distribution of the electrons with occupied electron states up to the Fermi energy. At zero temperature, the Fermi surface separates in wave vector k-space the occupied electronic states from the empty ones. For free electrons, the Fermi surface consists of a sphere with radius k F. In real crystalline metals, the shape of the Fermi surface is much more complicated and determined by the number of conduction electrons per atom as well as the symmetry of the lattice. Because the electron states close to the Fermi surface are responsible for the main characteristic properties of metals, viz. electrical and thermal conductivity, superconductivity, thermoelectric effect, and so on, knowledge of the Fermi surface has an important meaning for the understanding of the electronic transport. Many experimental methods exist for the investigation of the Fermi surface. The most important ones are known as the de Haas—van Alphen and the Shubnikov—de Haas effects, where oscillations of thermodynamic and transport properties of metals in a magnetic field are measured to get detailed information on the shape of the Fermi surface. In this chapter, we briefly describe milestone experiments connected with the main topic of this book. 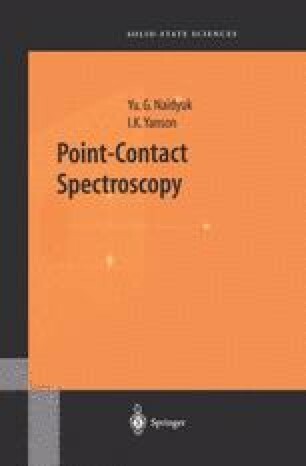 These achievements gave undoubtedly the necessary impact to the further development of point-contact spectroscopy.